I am glad you’re here. Whether you are searching for something specific or you simply stumbled across my site, please browse and enjoy... Yes, there are posts about scratch building radio controlled airplanes that are fun to build and fly. There are even some interestinggraphics I have created using Illustrator that might appeal to you. Day 80But, whatever your reason, I hope you take a few minutes and look at a few of my posts about my experience reading the Bible In 90 Days. If nothing else, take a moment to read day 80 as it best describes what the Bible is all about. RC Project – Douglas DC-3 I am currently building an electric powered Douglas DC-3 Radio controlled airplane. Mainly constructed of foam and balsa, the fuselage is strengthened with Fiberglas. She will have a wingspan of about 8 feet and weigh just over 7 pounds. The aircraft will have retractable landing gear. Plans are to paint the bird in the “Bonanza Airlines” scheme and look something like the photo link below. 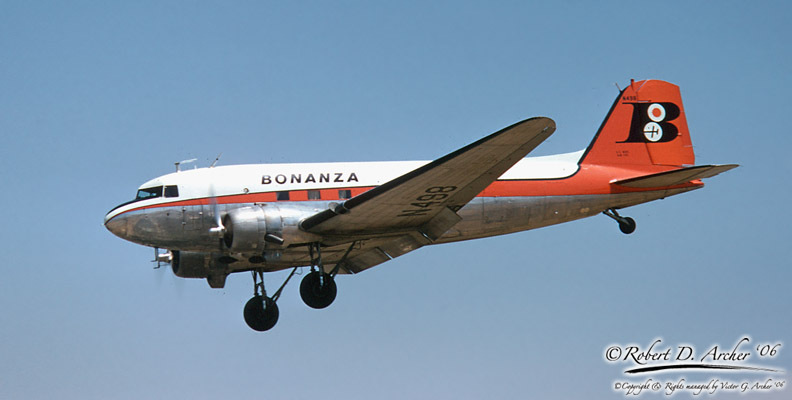 By the way, the Bonanza image credit above goes to Robert Archer. Progress has been a little slow lately but more updates are coming soon. Working with the wing servos and electrical wiring soon. Plans are to see her fly in the spring of 2014. Subscribe to my RSS or come back and visit soon.